The 2016 Honda VFR1200X, an adventure-styled motorcycle, joins the Honda adventure family in America, comprised of the CB500X, the NC700X, and the all-new CRF1000L Africa Twin. 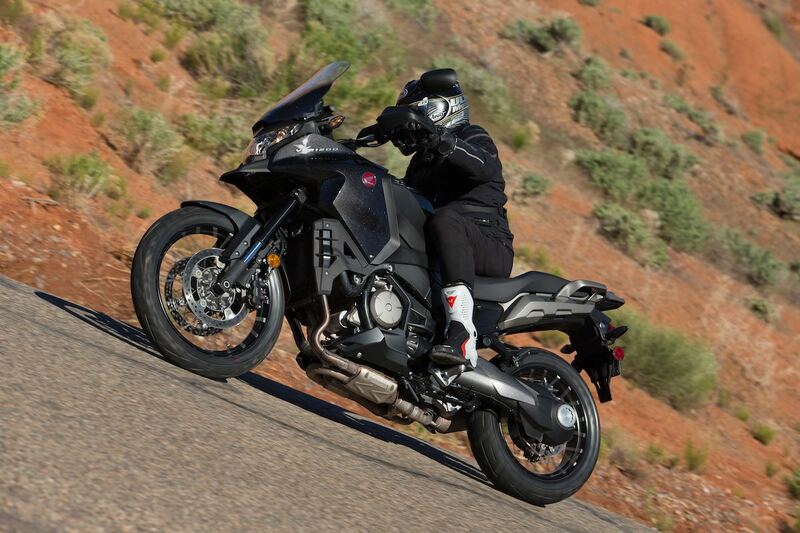 Honda’s research tells them the ADV segment is made up of essentially two types of riders—the hard-core ADV motorcyclist who wants a more off-road focused machine with touring capability and extreme reliability, and riders who are looking for the ADV image with touring comfort and convenience, coupled with low maintenance. The 2016 Honda VFR1200X is most definitely a street machine, however it does have some off-road capability; certainly fire-roads will be no problem if you want to do some exploring. The Honda is now the other main player of the adventure sport category, joining bikes like the BMW S1000XR and Ducati Multistrada. 1. The “X” first appeared in Europe in 2011 as the Crosstourer. Although new to America, the VFR1200X is essentially the same as the Euro Crosstourer. 2. The VFR1200X is priced at $15,599 for the conventional gearbox, and just $400 more for the DCT (Dual Clutch Transmission) version. A range of Honda Genuine Accessories can be purchased at the same time, are covered by the same warranty and can also be included in the Honda Financial Services loan. 3. It is available in any color, as long as it’s black. Actually, the VFR1200X paint is an attractive metallic Pearl Black which suits the bike well. Other color options available in Europe are not available here at present. 4. The VFR1200X is powered by Honda’s incredible 1237cc, 76-degree Unicam V4. The motor, previously used in the discontinued VFR1200F, has been re-tuned to produce even more low-and mid-range grunt; it is deceptively powerful. Several times, the relatively low-revving V4 and droning exhaust note combined to lull me into thinking I was going slower than I was. I found myself glancing down and being astonished to see the speed I was carrying; it simply didn’t feel like it. In fact, the motor was so torquey that when riding the very tight and twisty roads around Moab that included some slow hairpin turns at little more than walking pace, I never needed first gear! The motor redlines at just 9000 RPM, but revving to that point is unnecessary. Overtaking cars in a short space requires dropping down a gear or two, but those situations are exceptional. In normal circumstances the VFR motor produces an amazing amount of power that will pleasantly surprise owners. 5. The throttle-by-wire system also uses cables to give the rider more feel and a smoother application. It works in conjunction with an impressive suite of electronic aids that have three levels of traction control (plus Off), that combine with the top-notch linked ABS brakes. A large square button on the fairing side top, under the left handlebar, allows the rider to cycle through the settings on-the-fly. I didn’t bother changing the traction control from its default Level 3, as it was perfect for the riding I was doing in Moab. The roads were narrow, bumpy, and most corners had some level of grit, gravel or dirt on them. The VFR1200X simply never misbehaved at all. I felt a couple of small twitches at the rear, but they didn’t alarm me as the VFR handled them with zero drama. 6. The 2016 Honda VFR1200X’s suspension works exceptionally well. Clearly, because of the engine’s prodigious power output, the suspension has to be on the firmer side, as this bike is more than capable of spirited sport riding. However, it is somewhat softly sprung, so I found it soaked up all the bumps and potholes I came across. The VFR1200X is definitely fire-road capable. The firm damping ensures the chassis settles quickly after a bump, and the great suspension translates to nimble, stable road handling with a pleasantly neutral turn-in. Overall the handling is very user-friendly and highly intuitive; this is a very confidence-inspiring machine to ride. 7. The ergonomics and seating are friendly. The comfortable rider triangle and shoulder-width handlebars ensures that the VFR1200X is agile and reactive to steering input. Being an ADV bike, the handlebars are raised quite high; optional risers are not currently offered by Honda. The VFR1200X has a comfortable seat and is more than accommodating for long rides. The front section allows for sport riding and shifting your weight around, while the scalloped rear of the rider section pleasantly cups the (ahem) “appropriate body part”. I found I could slide my weight back in the seat and enjoy the ride. The front section isn’t incredibly narrow, so the reach to the ground will be a challenge for some riders. My inseam is around 33 inches and, although I could flat-foot both feet, swinging a leg over the VFR1200X was a fairly athletic endeavor. Although I didn’t try the passenger perch, the rear seat is stepped up a little, but not excessively, and the seat seems quite wide and well padded, similar to the rider’s. 8. ADV styling is de rigeur nowadays and the VFR1200X doesn’t disappoint. It is a very good-looking motorcycle and unlike its predecessor, the VFR1200F, the X model doesn’t suffer from an identity crisis. The Adventure theme is enhanced by the spoked wheels (19″ front, 17″ rear) that come shod with Pirelli Scorpion Trail tires, which grip well and allow for modest off-roading. 9. The windshield provides very good wind protection. Short of an electrically adjustable screen, this has to be the easiest to operate adjustable windshield ever. It is one-hand height adjustable from the seat, using a large easy to use lever on the left. Someone put a lot of thought into this, and it shows. 10. Fuel capacity on the VFR1200X is nearly six gallons, and the range is over 200 miles. I averaged around 38 mpg, according to the dash computer. I suspect that, in normal usage, fuel consumption is more likely to be in the low- to mid-40s. I was performance testing the bike and didn’t use the throttle particularly sparingly. I don’t think it’s unreasonable to expect owners to average well over 200 miles to a tankful and, as the bike is so supremely comfortable, this will be welcome news to the long-distance touring riders. 11. The VFR1200X weight is typical for an open-class ADV bike. It tips the scales at a claimed 603 pounds, fully fueled up and ready to ride. Putting the bike’s weight over the 600-pound mark can be attributed to the shaft drive, rather than a chain final drive. The brilliant DCT transmission adds approximately 23 pounds to that number, should you decide to go that route. Fortunately, the Honda is beautifully balanced because, as always, the factory has gone to a great deal of effort to centralize the mass. The VFR1200X’s weight only really became apparent to me when pulling the bike off its sidestand on a slight sideways downhill slope. It’s a six-speed automatic transmission that can be shifted manually using a push button (downshift), and pull switch (upshift), on the left handlebar. Because DCT uses two clutches, the shifting is, in effect, seamless, and shifts are almost imperceptible to the rider. At times, I looked down and was surprised to see the gear I was really in, as I had had no idea the transmission had made one change, let alone several. Shifting down from 3rd through 2nd to 1st can be a little less than elegant, however. Overall, the DCT gearbox is as smooth as a politician trying to solicit your vote. There is no ‘slush box’ or variable belts, so, no, this isn’t like a scooter or your automatic transmission car. In other words, one rotation at the crankshaft does something at the rear wheel. Acceleration is instant and powerful, and there is plenty of feel at the throttle for what’s happening at the rear tire contact patch. In ‘D’ (Drive) mode, the gearbox upshifts through the ratios quickly and reaches top gear (6th) as soon as possible. This is an economical mode and friendly for commuters and urban riders. As a sportbike aficionado, I preferred the instant performance of ‘S’ (Sport) mode. Sport mode has three levels which can be cycled through on-the-fly, provided the throttle is closed. S1 is the most conservative, through to S3 mode, where the gears are held longer and the transmission tends to stay in the lower gears to encourage more aggressive riding. I found S2 to my liking on the varied Moab terrain. Downshifts are executed at just the right moment and this is especially critical when overtaking. This is the 3rd generation of DCT, and Honda has really nailed it. On one occasion, there wasn’t a lot of room between corners, so I had to really goose the VFR to get past a couple of cars towing trailers. I gave the throttle a handful and the bike reacted perfectly—it immediately shifted down from 6th down to 4th, and the astonishing VFR V4 torque did the rest. I was very impressed. DCT is $400 more expensive than manual on the VFR1200X, and I now believe I’d buy the DCT. I liked the first-gen version in the VFR1200F a few years ago, but I was pleasantly surprised how really good it has become in this X model. I rode the manual transmission machine for a while and was interested to find that I missed the DCT—and that’s nothing against the manual gearbox because it is smooth, precise, and a pleasure to operate. I suspect some people will scoff heartily at DCT and simply never entertain it–and that’s okay; Honda make both versions and will carry on with that. But, if you have an open mind to something new, I’d urge you to at least try it–I suspect you will be converted. 13. Accessories are available at dealers now. The list includes a centerstand, light bar, tank pad, wind deflector, heated grips, and accessory power outlet for the passenger (one is included stock for the rider). For touring riders, there are attractive brushed aluminum panniers and a top box that will take a full-face street helmet. For an ADV-style helmet. you’ll need to use the left side pannier. Inexplicably, Honda has not fitted cruise control to the VFR1200X, and there currently isn’t an accessory version either. Self-canceling LED turn-signals are standard equipment—hooray!—as is an LED taillight. Honda has a winner with the VFR1200X. A very special V4 motor smoothly powers this bike as fast as you want to go. It’s deceptively quick, so if your license isn’t in the best of shape, please be warned—this machine won’t help. If you’re a rider who appreciates performance and good handling, likes the ADV look, amenities, and comfort, and wants the option of taking the odd fire road or two, then the new 2016 Honda VFR1200X will deliver. It exudes that legendary Honda quality, and, most importantly, it is simply a joy to ride, whether you’re wanting to just pop down to the shops, or explore all four corners of this awesome country of ours.